As Lucia is soon approaching, it's always a Swedish tradition to prepare a variety of sweet bakeries for the holiday specific event. One of the most traditional Swedish Lucia bakeries is the Lussekatter. Probably you have tried them around many times around the bakery stores, who have just started baking those, if not please try it they are really good. Lucia and Lussekatter together is an old Swedish tradition, so in this week’s Misi review we will introduce a Lussekatt Receipt so that you can try baking the traditional Lussekatter with your friends during Lucia. The tradition of baking Lussekatter started from centuries ago. It was told that Lucia gave Lussekatter to children’s for protecting them from evil demons. 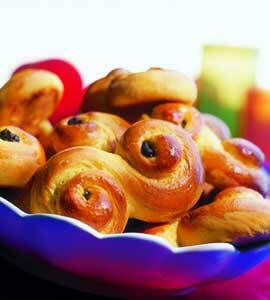 At that time the saffron color of the Lussekater was thought to scare the demons away. Nowadays Lussekatter is one of the most loved traditional Swedish bakeries during the winter holidays. 1st Melt the butter in a saucepan and then pour over the milk. Allow to cool to 37 degrees and then put in food processor. Crumble in the yeast and stir until it dissolves. Add the saffron, salt, sugar and eggs. 2nd Mix in half of the flour. Then add the flour per deciliter until the dough feels solid enough. 3rd Knead the dough for 15 minutes. Let the dough then rest at room temperature, covered with a towel, for 30 minutes. 4th Cut dough into pieces of about 60 grams. Shape the first round, then to slightly elongated pieces. Let them rest a minute. 5th Roll out the dough to oblong, shapes as seen in the picture, about 30 centimeters long. Shape them into buns. Use flour if the dough sticks. 6th Place the half finished Lussekatter on a baking sheet with baking parchment. Push raisins into each end. 7th Allow the dough to rise during the towel for about 45-60 minutes. The Lussekatter should grow to twice its normal size. Preheat the oven to 230 degrees. Crack an egg into a cup and stir it lightly. 8th Brush gently with the stirred eggs and bake them for about 6 minutes. They should be bright. 9th One can also divide the dough into 4-5 pieces and make the Lussekatt rolls of these. Roll out the dough, spread butter and sprinkle the dough with vanilla sugar and add raisins. Roll into oblong rolls, cut the tabs and let the dough rise again. Brush with egg, sprinkle with pearl sugar and bake at 200 degrees for 12-14 minutes.